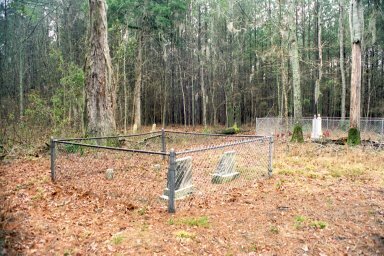 This cemetery is located on a dirt road off Howell's Mill Road, about one mile west of Highway 362, north of Highway 521 (Ehrhardt Road). This is about 10 miles southeast of Bamberg and about the same distance, southwest of Branchville. At the crossroads of Howell's Mill Road and Hwy 362 is the Bethel Baptist Church on the northeast corner and its cemetery on the southwest corner. At the entrance of the dirt road, on your left if you are traveling west from 362, is a small home made sign denoting the cemetery. This was the original location of the Zion Methodist Church which, according to a church member, was relocated around 1900. 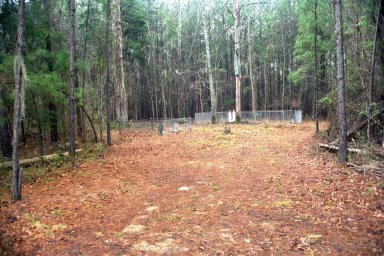 The cemetery, which probably was situated to the right of the church at the edge of a cleared field, is now in a heavy pine forest and is not visible from the main road. The area has been blanketed with 100 years of fallen limbs and pine needles and has been used as a dumping area for limbs and other yard debris. The terrain is very rolling, causing me to wonder if some unmarked graves are now covered by pine needles and debris. 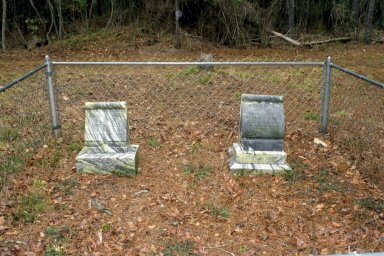 There is one fenced plot where the fence is not in good repair and there are no visible gravestones. Dr. J. B. Black, Sr. Note: According to my grandmother's notes in the Stokes genealogy (Book of Stokes by J. Lemacks Stokes, 1915) Daisy Margaret Stokes, daughter of Jefferson Stokes and Mary Elizabeth Tatum Stokes, also is buried here. She was born Nov 10, 1870 and died Feb 15, 1891.